Where does 'rights based advocacy' leave John's Campaign? Carers do not have constitutional rights in the current NHS Constitution, although there is a recent consultation exercise which has been completed this year. According to the British Institute for Human Rights “A pocket guide for carers”, “In a survey of carers conducted by n-compass: 45% of respondents felt that human rights are very important or important to their caring role; less than 30% felt confident that they knew what their rights were; only 15% felt confident in advocating for the rights of those they care for. Source: Carers’ human rights consultation (September 2011)” (BIHR, 2012). The current Government is in the process of repealing the Human Rights Act (1999) in accordance to their recent electoral mandate, but most academics in law feel that it would be very difficult for the UK to wish to escape the jurisdiction of the European Convention of Human Rights. This has not only been discussed at length in the academic journals, but also finally in the mainstream newspapers. The BIHR document lists important human rights for carers, which indeed comprise the “essential toolbox” of a rights-based approach for carers: these are the right to respect for private and family life, home and correspondence (Article 8), freedom from inhuman and degrading treatment (Article 3), the right to be free from discrimination (this is protected by both the Human Rights Act (Article 14) and Equality Act 2010), and in extreme circumstances, your right to life (Article 2). Looking at the issue of a right for carers of those living with dementia the right to stay with them in hospital, it is essential to note that people with dementia have human rights of their own. Lady Hale in her judgment in P (by his litigation friend the Official Solicitor) (Appellant) v Cheshire West and Chester Council and another (Respondents) and P and Q (by their litigation friend, the Official Solicitor) (Appellants) v Surrey County Council (Respondent) at  UKSC 19 made it perfectly clear that these rights are indeed universal and inalienable as you would expect them to be (they are also protected by the Universal Declaration of Human Rights). But I feel it is essential to look at the Convention itself. 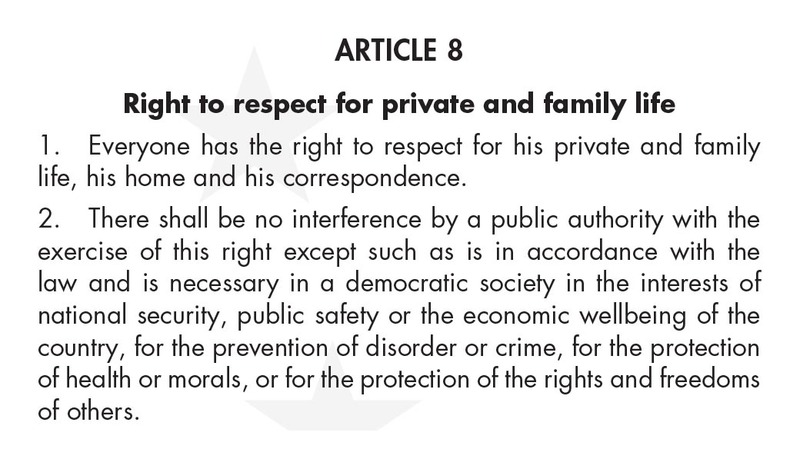 You could equally argue that the law should uphold respect for a person’s private life, home and correspondence. It has been, for example, estimated that there were about 670,000 unpaid primary family carers for people living with dementia in the UK. These carers will therefore have their own perspective of ‘private and family life’. But there are pockets of law from the European Court of Human Rights which throw light on the direction of travel of interpretation of article 8. Take for example application no. 14462/03 by Valentina Pentiacova and Others against Moldova in 2005. The case essentially concerned the availability of haemodialysis for chronic renal failure. Their case was allowed although there was an obligation to ‘exhaust domestic remedies’ as per article 35(1). Domestic courts can interpret the European legislation within a margin of appreciation’. However, it is striking that the judgment makes reference to the wellbeing of people with disabilities. Dementia is a disability under the guidance to the Equality Act (2010), and it has been argued that dementia is a disability under the UN Convention of Rights for People with Disabilities. This section of the judgment points to the Judges’ concern about the law, if not being upheld acting to the detriment of people with disabilities. One suspects that lawyers defending John’s Campaign in the European Court of Human Rights might be sensibly be advised to advise the Court on whether carers not accompanying a person with dementia acts to the detriment of the wellbeing of that person with dementia. Another interesting case judgment involves the second section decision on the admissibility of application no. 27677/02 by Nikky Sentges against the Netherlands. The applicant had been diagnosed with Duchenne Muscular Dystrophy (DMD), a disease characterised by progressive muscle degeneration, loss of the ability to walk and often the loss of lung or cardiac functions. The applicant complained that his request to be provided with a robotic arm was denied. He submitted that the right to respect for his private life, as guaranteed by Article 8 of the Convention, entailed a positive obligation for the State to provide him with, or pay for, this medical device. But here the discussion included what the ‘positive obligations’ of the State might be, and the exact scope of Article 8. Here it might be that the European Court of Human Rights views that the admission of a person with dementia into care does not constitute an exceptional disruption of private and family life, and so would therefore not apply. 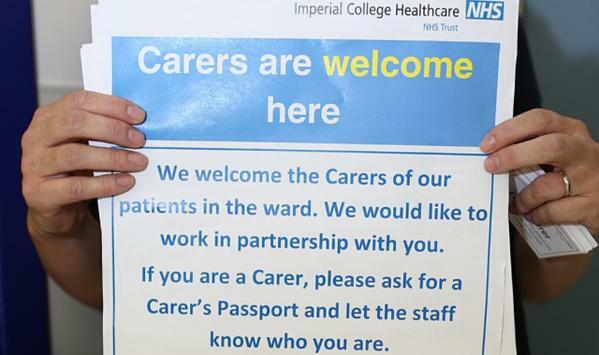 However, against this, there is a huge literature in the medical press on how an acute admission of a person with dementia is incredibly disruptive to the ‘caring relationship’. A third interesting judgment is a fourth section decision as to the admissibility of the application no. 56550/00 by Antoni Mólka against Poland. The applicant was living with a ‘severe dysfunction of the limbs and is confined to a wheelchair’. And here the judgment is very telling. Here, lawyers defending John’s Campaign would do well to emphasise that measures such as the company of a carer for a person with dementia in an acute admission would facilitate the wellbeing of that person with dementia. This is a very powerful case to make, as shared care plans involving the carer are designed precisely to optimise the health and wellbeing of the person with dementia (see the RCN/Carers Trust “Triangle of Care”). All three judgments are not directly about the material facts in John’s Campaign. I am not in fact aware of the exact same case in any jurisdiction covered by the jurisdiction, which would lead me to think this would make an interesting ‘test case’ of public policy. Despite the fact domestic jurisdictions are free to operate a principle of subsidiarity in law, I think a legal case for the substantive issues in John’s Campaign can be made out, especially if such arguments emphasised the person wellbeing of the person with dementia and carer, and the economic wellbeing of the country. This is definitely, as such, ‘unfinished business’.